Francis David Chapot was born February 24, 1932 in Camden. His family owned a horse farm and he began riding at an early age. A good athlete, he competed in a number of team sports but always came back to riding. Frank showed early talent for show jumping and became part of a group of young riders—including best friend Bob Rost—who would pioneer the sport in the United States. Ridding through his high school years and in college, he moved from the summer show season on the east coast to the winter season in Florida. Frank graduated from Penn in 1955 and was inducted into the Air Force shortly thereafter. While on active duty he was allowed to try out for the U.S. Equestrian Team and he made it at age 24, becoming USET’s youngest member. In June 1956, Frank competed in the Olympics—not in Melbourne, but in Stockholm. Australian law mandated a 6-month quarantine of horses, which made holding the equestrian events there impossible. He finished 27th individually and the U.S. team finished 5th. Frank won his first gold medal in 1959 with teammates Billy Steinkraus, Hugh Wiley and George Morris at the Pan American Games. He also won an individual silver. At the 1960 Olympics in Rome, the U.S. team won a silver medal. Frank rode Trail Guide, a 21-year old former cavalry horse. In 1963, the U.S. won gold again at the Pan American Games. The team’s top rider was 19-year-old Californian Mary Mairs. Frank and Mary struck up a romance and were married in 1965. They became the first husband and wife to compete on the same Olympic team for the United States. In 1966, Frank finished second in the European show jumping championship, making him the first American to win a medal in this event. In 1967, he and Mary won team silver in the Pan American Games. In 1968, Frank barely missed out on an individual Olympic medal, finishing fourth by a fraction of a point. He won a second Olympic silver medal in Munich in 1972 as part of the U.S. team. Frank rode in the 1976 Olympics, making his record-tying sixth appearance in the Summer Games. After retiring as a competitive rider, Frank succeeded Steinkraus as USET Chef d’Equipe. He coached the Americans to their first Olympic gold medal, in 1984, and world championship, in 1986. 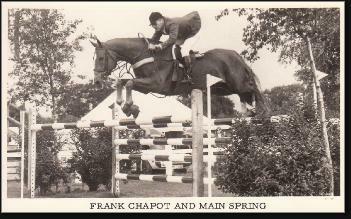 He also judged shows, designed jumping courses and wrote Winning with Frank Chapot. In 1988, Frank’s prize pupil, Greg Best, won Olympic silver aboard Gem Twist, a horse Frank and Mary trained. Frank continued to coach the team until 2004, sporting his signature dark glasses and baseball cap. He went out on top, leading the U.S. to a gold medal in Sydney at the 2004 Olympics. Frank and Mary were both inducted into the Show Jumping Hall of Fame in the 1990s. Their daughters, Laura and Wendy, became top equestrians. Their business, Shado Farm in Neshanic Station, is regarded as one of the best in the country. Frank passed away in 2016 at the age of 84.